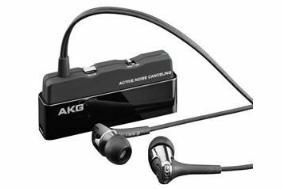 AKG develops premium headphones for iPhone and Blackberry | What Hi-Fi? There are two models: the £90 K 370 and £120 noise-cancelling K 390NC, which will be available shortly. Both deliver "unrivalled sound quality", says AKG, with "rich bass and clear treble reproduction". They're made from the highest quality materials and the integrated microphone in the K 370 means it can also double as a mobile phone headset. The button integrated into the remote control allows users to take calls and can be used as a remote control with Apple iPhones, enabling you to play, pause and skip tracks without taklng the phone out of your pocket. The AKG K 370 is supplied with a travelling case and an aeroplane adapter. For those who want noise-cancelling, AKG has developed the K 390NC designed to filter out background noise when travelling on trains and planes. Like the K 370, it has an integrated microphone and remote control for use with iPhone and Blackberry handsets.